Chiavari Chair has become one of the most popular seats for special events and occasions and have replaced the more traditional chair cover. Not only have they been featured in some high profile entertainment events such as the Grammys, they are becoming increasingly popular for weddings and business events. The Chiavari Chair is a beautiful chair with no arms. It is elegant, practical and affordable. You will find them to be a smart selection for any event whether it be 30 chairs of 500 chairs you are looking for. They come in an array of colours including clear, brown, mahogany, silver, gold, black and white. The silver Chiavaris are probably one of the more popular colours. They have a metallic finish so if you are looking for elegance the silver colour may be right for you. 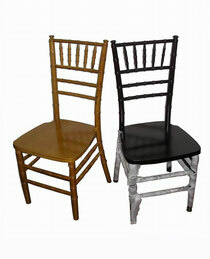 Mahogany Chiavari Chairs are the darkest colour next to the black ones. If you are going for a classy look the mahogany is an excellent choice. White Chiavari Chairs look great for winter weddings. If you have a white theme or are going for a ying yang look then the white colour may be right for your. If you wants some ideas of how the Chiavari Chairs look in a hall or business setting then Google Chiavari Chair pictures to get an idea of how these chairs will look. You won't be disappointed.